Deception Island is an island in the South Shetland Islands off the Antarctic Peninsula which has one of the safest harbours in Antarctica. A recently active volcano, its eruptions in 1967 and 1969 caused serious damage to the scientific stations there. The only current research bases are run by the Argentine Army and Spain. The island, located at 62°57'S 60°36'W is approximately circular with a diameter of about 12 km (7 mi). Its highest point, Mt Pond, has an elevation of 542 m (1778 ft), and over half the island is covered by glaciers. The centre of the island is a caldera formed in a huge eruption (VEI-6) which has been flooded by the sea to form a large bay named Port Foster, about 9 km (5.5 mi) long and 6 km (3.6 mi) wide. The bay has a narrow entrance, just 230 m (754 ft) wide, called Neptunes Bellows. Adding to the hazard is Ravn Rock, which lies 2.5 m (8 ft) below the water in the middle of the channel. Just inside Neptunes Bellows lies the cove Whalers Bay, which is bordered by a large black sand beach. Several maars line the inside rim of the caldera, with some containing crater lakes (including one named Crater Lake). Others form bays within the harbour, such as the 1 kilometre wide Whalers Bay. Since the early 19th century Deception Island was a favourite refuge from the storms and icebergs of Antarctica. It was first used by sealers, then in 1906 a Norwegian-Chilean whaling company started using Whalers Bay as a base for a factory ship, the Gobernador Bories. Other whaling operations followed suit, and by 1914 there were 13 factory ships based there. The station did not actually process whale blubber, that being done on the ships, but instead took the carcasses and boiled them down to extract additional whale oil, using large iron boilers, and storing the results in iron tanks. Whale oil prices dropped in the Great Depression, making the station uneconomic, and it was abandoned in 1931. Advances in factory ships made shore stations for carcass processing unnecessary, and so it was never reoccupied. 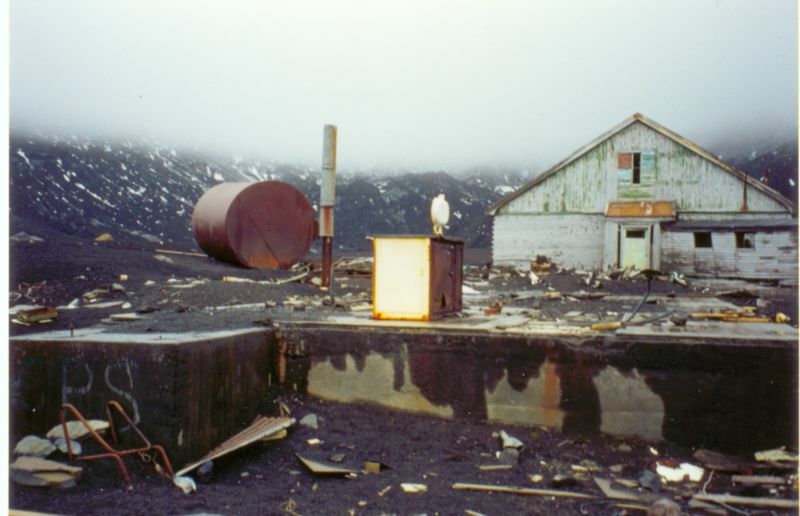 45 men were buried in the station's cemetery, but the cemetery was buried in a 1969 eruption, and the only remaining signs are the rusting boilers and tanks. 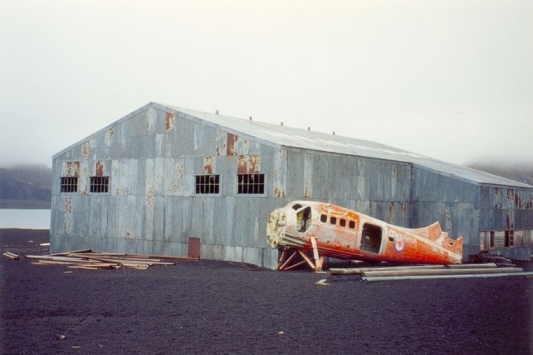 Other remains at Whalers Bay include an aircraft hangar with a bright range derelict airplane fuselage outside (removed in 2004), and the British scientific station house (Biscoe House), with the middle torn out by the mudflows in 1969. 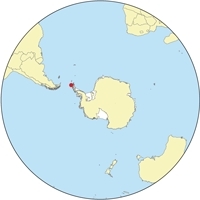 In the 1940s and 1950s, Argentina contested control of Deception Island with the UK with some removals of the sovereign flag and temporary occupation of the island. On February 3, 1944 the British established a permanent base on Deception Island as part of Operation Tabarin, and occupied it until December 5, 1967, when a volcanic eruption forced a temporary withdrawal. It was used again between December 4, 1968 and February 23, 1969, when further volcanic activity caused it to be abandoned. In 1955 Chile inaugurated its station Pedro Aguirre Cerda at Pendulum Cove, to increase the Chilean presence in the sector claimed by that nation. In 1961 Argentina's president Arturo Frondizi visited to show his country's interest. In 1963 the American Coast Guard icebreaker Eastwind, WAGB 279, visited Deception Island. There were two scientific stations active, one British and one Chilean. The Chileans had an air strip and flew a DeHaviland Beaver back and forth to Punta Arenas for resupply. There were active fumaroles spewing noxious gases and some fumaroles had churning volcanic ash in the depressions. The Eastwind ran aground inside the volcano which is likely the only time an American military ship ever ran aground inside an active volcano. The ship refloated with the rising tide. In 1969 a violent volcanic eruption demolished the Chilean stations Pedro Aguirre Cerda and Gutierrez Vargas. The volcano has mostly taken care of other attempts to maintain permanent facilities, and as of 2000, there were only two scientific stations still in use, both summer-only: Spain has Gabriel de Castilla, and Argentina its Deception station. Penguins on Deception Island. January 1962. 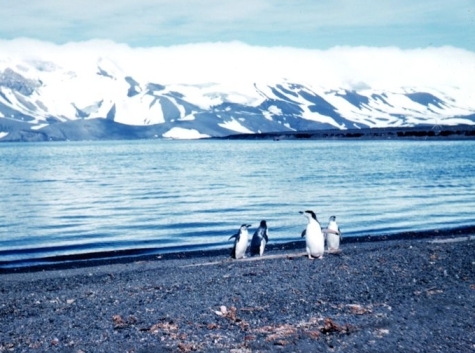 Deception Island has become a popular tourist stop in Antarctica because it has several colonies of chinstrap penguins, as well as the novel possibility of making a warm bath by digging into the sands of the beach. Baily Head on the west side of the island holds one of the world's largest chinstrap rookeries. 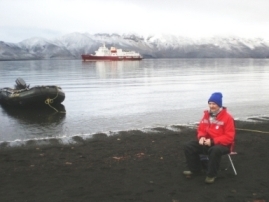 After the Norwegian Coastal Cruise Liner M/S Nordkapp ran aground off the coast of Deception Island on January 30, 2007, fuel from the ship washed into a bay. Ecological damage has not yet been determined. 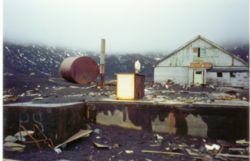 On February 4, 2007 the Spanish Gabriel de Castilla research station on Deception Island reported that water and sand tests were clean and that they had not found signs of the oil, estimated as 500-750 litres of light diesel. Deception Island exhibits some wildly varying microclimates. Some water temperatures reach 70°C (158°F). Near volcanic areas, the air can be as hot as 40°C (103°F). This page was retrieved and condensed from (http://en.wikipedia.org/wiki/Deception_Island) see Wikipedia, the free encyclopedia, April 2009.